As requested, a new page with the full text and illustrations has been added here and may also be accessed via the navigation bar above the header. The sudden death of Cynric Williams last week was a shock to everyone who knew him, and is a painful blow to the model railway community, especially those who are members of his online forum Western Thunder. His input to the Basilica Fields project cannot be underestimated; his input helped shape my plans and and showed me how some aspects of the design that I thought would be too difficult to achieve were possible, but more than that, he was prepared to to invest his time and energy to help make them a reality. Cynric was an early proponent of the Basilica Fields concept; he once told me that he’d always been fascinated with the lines into and around London, especially in the Victorian and Edwardian period, and the inclusion of the Great Western Middle Circle passenger services and the Smithfield goods service sealed his interest and support. He was the first person to offer a helping hand, and asked if, when the time came, he could build one of the condensing Metro tanks. Unfortunately it wasn’t to be; when Artillery Lane with its heavy GW presence was put into abeyance and instead plans for The Rookery developed, the Metros dropped down the pecking order. However that was no deterrence to Cynric’s interest or involvement, and he offered to build some GW non-passenger coaching stock instead. Having seen the plans for The Rookery and the loco yard, he offered suggestions on the best was to produce the viaduct, the houses and the pub (and its etched glass windows) by using his laser cutter. I’d send him rough sketches and photos, and a few days later boxes of lasered mdf samples would arrive for me to play with. The Great Western Railway was in Cynric’s veins. His father worked for BR between 1960 and 1988 mainly accounting and latterly implementing revenue collection systems, his grandfather worked for the GWR and WR in Birkenhead goods office, his great Grandfather was in the Permanent Way department responsible for Bala-Ffestiniog, and his Great grandmother was Crossing keeper at Llys. It’s not surprising then that his two sons were given middle names of Brunel and Churchward! One day, three years ago, I had a parcel arrive in the post which turned out to be an official railway clearing house map of ‘London and it’s Environs’ which had belonged to, and was signed by Cynric’s grandfather. Measuring several feet in either direction when unfolded, it was obviously irreplaceable for sentimental reasons alone, but Cynric, with typical generosity, allowed me keep it on indefinite loan. After five years of email communication, we finally met face to face at the Reading trade show last month where again he had some samples from his laser cutter and I was able to return his map. Among the things we talked about was the future of Basilica Fields and he said was looking forward to seeing the loco yard for the Challenge 33 competition develop. I’ve still got his words “I’ve been waiting a long time for this!” ringing in my ears. A few days before Christmas Cynric sent me what turned out to be a final little parcel of laser-cut pieces, among them a pair of buffer height gauges, one for 7mm Finescale, which makes up the majority of my day work, and one for ScaleSeven. In a small but important way Cynric will continue to contribute to Basilica Fields as every new item of stock that runs on the layout will have the buffers gauged by his ScaleSeven jig. Basilica Fields has lost a valuable supporter and generous contributor, and the project will be poorer for his untimely passing. Of course, in the grand scheme of things his loss to the model railway community diminishes to insignificance next to the insuperable loss to his wife, his two young sons, and to his wider family and close friends. Over the last week I’ve been thinking that it would be appropriate to have some sort of permanent memorial to Cynric on Basilica, something that those who knew his model railway activities would associate with him. Given that he produced lasered mdf parts for many of his modelling friends and acquaintances, a shop or business relating to wood or woodwork seemed relevant, and I initially thought of a timber importer but that doesn’t really reflect the design skills he employed to produce the parts. Flicking through my large collection of old photos this one finally jumped out, and to my mind reflects Cynric supplying all those bits of wood to enable us to build our masterpieces. I think I’m right in saying that Cynric had done some cabinet-making too, so that makes the photo a particularly apropos choice. 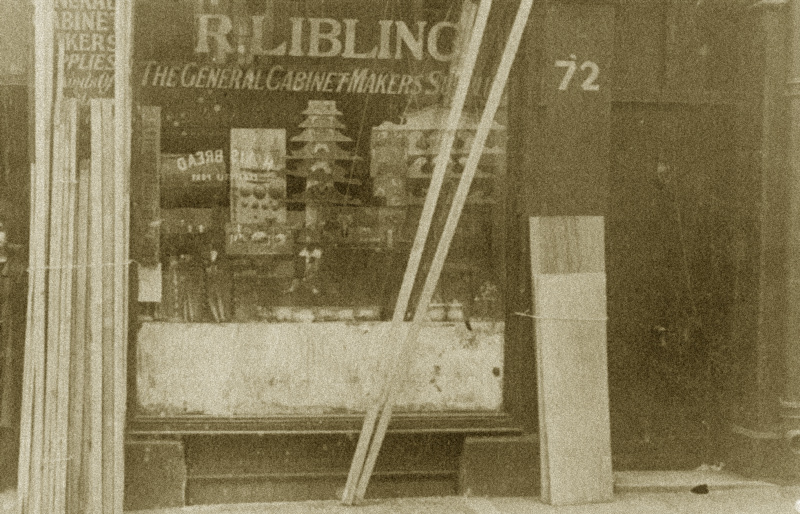 The General Cabinet Makers Supplies, 72 Hare Street, Bethnal Green – it’ll be easy enough to change the name to C. Williams. In the years leading up to those covered by Basilica Fields there were 121 cabinet makers and associated businesses in Bethnal Green, with eight timber yards along the Bethnal Green Road. It was a prime location for the trade as cheap imported wood was brought into the area via the Regents Canal. Would you Adam & Eve it? Overnight the number of visitors to this journal has hit the 50,000 mark. I have to admit, it’s a bit humbling, for in model making terms, never before has so much been written with so little to show for it, and I can only assume that it’s the historical aspect to the journal over the last two and a half years has proved to be popular, but I want to redress the balance to a 50/50 split between historical witterings and modelling progress reports over the next 12 months. Stop laughing over there in Cambodia. The ability to see which country readers are in has only been available to me for the last four months, and perhaps not surprisingly visitors from the UK account for more than 8/10ths of visitors, with the USA and Australia in second and third place respectively. Of course there are many dropping in through various search engines – Google, not surprisingly leading the pack, and I suspect image searches or unrelated terms picking up some obscure factoid in the journal accounts for some of the more exotic locations such as Vietnam appearing in my daily reports (or maybe someone from Ho Chi Minh City really is interested in a Victorian knocker-up!). However, referrals from specific sites, whether through links I’ve created, or those made by website owners who have a genuine interest in what’s written here also account for a large proportion of visitors. Andy York’s RMWeb forum leads the way by a considerable margin (and I’ve recently set up an RSS feed to a mirror of this blog over there), with Steve Fulljames’ Fairlight Works blog, Cynric Williams’ Western Thunder forum, James Wells’ Eastmoor Blog, several threads on London Reconnections (thanks Lemmo!) and Paul Marshal Potter’s Albion Yard all sending a considerable footfall this way. Thanks chaps! Some referrals cause a sharp intake of breath, or a smirk, and some pure bewilderment such as the recent ones from the infectionvaginalyeast blog… I’ll omit the link to that last one and leave you to find it yourself if you really have a need to find out more. A couple of weeks ago, with his eye on the stats, Graham asked what was I planning to do to mark the occasion, and I replied that a celebratory old photograph was the obvious choice, but of what? After a long search it turns out that excepting the aforementioned Royal Jubilees of 1887 and 1897 and annual ecclesiastical celebrations, very little merrymaking en masse seems to have gone recorded by camera and emulsion, and it wasn’t until the Peace Parties of 1919 photographs that street revelries seem to have become more common. 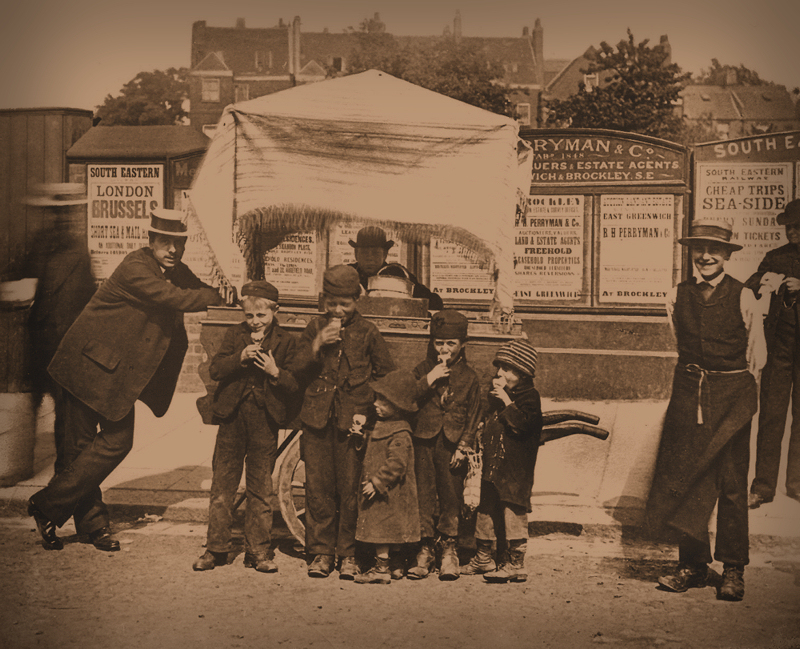 You might expect that the hard life of the average East Ender of the late Victorian and early Edwardian period gave them little little reason for conviviality. 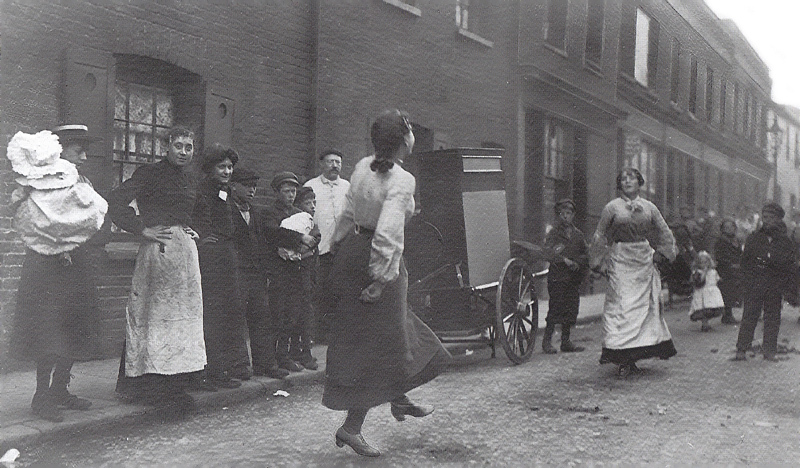 Not so, it seems, as given half a chance and a little music, folk were more than inclined to cast off the burden of everyday woe and dance a cheerful jig, and there are plenty of contemporary photographs to prove it. Indeed, the work and play of the East End inhabitants became quite a popular subject for contemporary postcards. And so here is a perfect example; the photo was probably taken during the mid-Edwardian period and turned into a postcard by J. Beagles & Co circa 1910. It is entitled ‘The Piano Organ’ and shows that that the arrival of the organ player and his repertoire of jolly tunes to a typical East End street is all the excuse needed for the locals to have a bit of a knees-up.